Believe it or not, entering Kasur from the Ferozepur Road sets a commuter back three times more than getting into Islamabad! The reason? The Punjab government’s benevolence towards a certain toll contractor. The toll plaza near Mustafabad Canal on the Ferozepur Road is just 15 kms from the city Kasur, and the toll has been set in Rs20 to Rs120 range, from a car to a heavy trailer, every time a vehicle passes through it. Interestingly, the Capital Development Authority (CDA) having constructed far lengthier network has set only Rs5 as toll for entering the federal capital once one gets off from the Lahore-Islamabad Motorway. 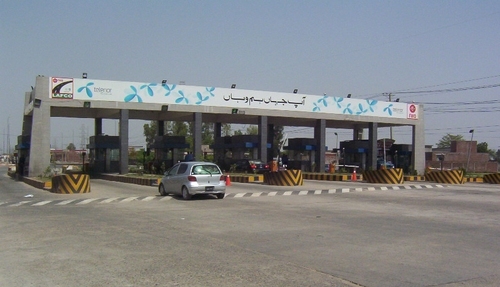 The toll plaza was handed over to the Lahore Ring Road Authority, whose chairman is Lahore commissioner. Interestingly, the toll fees of even the Lahore Ring Road – a far more expensive project with around Rs45 billion spent so far – is only Rs10. The denizens of Kasur though have to cough up double that amount – perhaps as a reward for turning the city into a PML-N stronghold. The 48 km Lahore-Kasur Road project was initiated by the former Punjab CM Pervaiz Elahi, while the present dispensation an effort to complete it after it was stuck in delays. Reportedly, many contractors stopped work and the project was completed, reportedly owing to the CM’s personal efforts. About one year ago, the government put a toll on the road on which previously there never was one – that too at rates so exorbitant. The process, this reporter of informed, runs like this: provincial highways department studies traffic frequency on a particular road, sends its data to the XEN concerned, bidding takes place on this ‘annual average daily traffic report’, and the chief engineers of provincial highways and Communication and Works (C&W) approve the toll. The authority to decide the toll is chief minister himself and no power on earth can change it. And this is where the catch is. The figures from ‘annual average daily traffic report’ obtained by Pakistan Today reveal that the toll plaza has gone for a song to a Model Town-based contractor – in exchange for just Rs71 million for one year, the contract incidentally expiring this month. On average traffic frequency, the overall take from this toll plaza should yield Rs200 million – no prizes for guessing who the decision makers intended to benefit at the cost of hapless commuters. The average daily traffic report studied at Kahna-Gajumata spot around 23kms from Lahore, the number of motorcycles/rickshaws is 8990, cars and pick-ups 8327, mini-buses and wagons 4112, buses/flying coaches 3329, trucks 2-axle 2154, 3-axle 1095, agri-tractors 129, tractor trollies 3-axle 543, 4-axle 18, while 62, 28 and 19, 4-axle, 5-axle and 6-axle trailer units respectively commute on both sides of Ferozepur Road every day. As the government has set Rs20 for cars, Rs30 for small bus/pick-up, Rs50 for bus/trailer (10 wheels), Rs120 for trailer, Rs20 for non commercial tractor and Rs50 for 1-axle tractor, on average calculated by the Highways department, the commensurate toll would work around Rs560,000 per day – and thus the annual figure Rs200 million. The commuters see red the moment they are made to pay the toll because they’ve already suffered owing to the road being under construction again. “Coughing up Rs20 for a distance of mere 15km is unjustified…if Shahbaz Sharif has taken personal interest in completing the project, the people should not be milked for it,” said Zeeshan Ansari, a lawyer by profession. The Lahore Ring Road Authority director, Col (Retd) Asim Khan was unwilling to talk on the disparity in toll rate, only saying, there were expenditures on the road such as watering the plants and paying for the electricity. The argument does not wash: the more the expenses, the more the initial bidding price should be – while it is actually the opposite in this case, the bid being one-third of the projected yield. Officials in the C&W department seeking anonymity said, the toll rate was the prerogative of the CM. An instance they quote is the toll tax proposed for the Lahore Ring Road: Rs15 per vehicle, reduced to Rs10 by the CM. XEN Okara, Naveed Bhatti, who conducted the bidding of the Lahore-Kasur toll plaza, said the it was handed over to the Lahore Ring Road Authority since March last year and even the bidding for this year will also be done by them. To a question, he said the CM approves the rates, while the XEN conducts the bidding which is approved by the chief engineer and is done as per procedure. To another question he said he did not remember the exact figures from traffic report and hence could not comment. The C& W special secretary Captain (Retd) Asadullah Khan said, there were proper laws as per which the rates are decided; the entire mechanism is available on the internet. There is no rate plan about this toll plaza on internet and there is no relexation for the villagers who are near to it.